10:10 1. 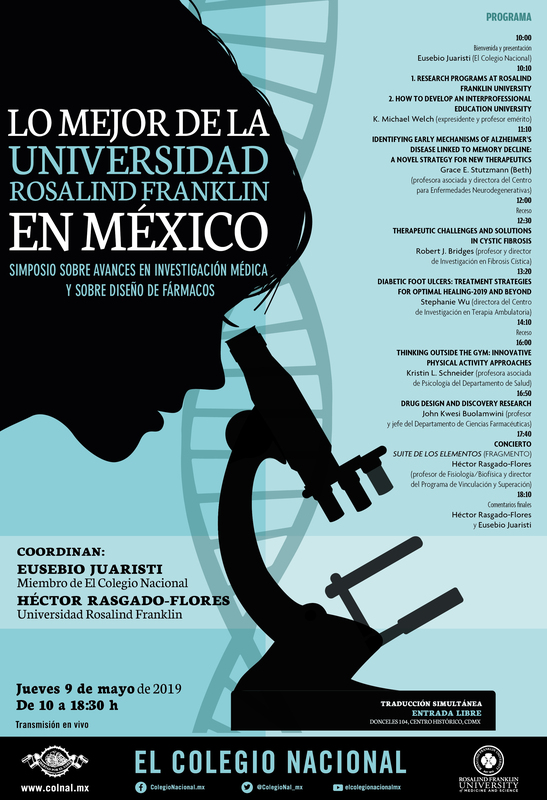 "Research Programs at Rosalind Franklin University"
2. "How to Develop an Interprofessional Education University"
11:10 "Identifying Early Mechanisms of Alzheimer's Disease Linked to Memory Decline: A Novel Strategy for New Therapeutics"
12:30 "Therapeutic Challenges and Solutions in Cystic Fibrosis"
13:20 "Diabetic Foot Ulcers: Treatment Strategies for Optimal Healing - 2019 and Beyond"
16:00 "Thinking Outside the Gym: Innovative Physical Activity Approaches"
16:50 "Drug Design and Discovery Research"